Santa is bringing our boys a play kitchen, and I could not be more thrilled! I cannot wait to see their faces as they rush down the stairs and see it all put together with a big red bow on top. It will be the perfect gift to get our morning started. The boys will be busy playing, while Conor & I get down that first cup of coffee (and mimosa), and start cooking breakfast. 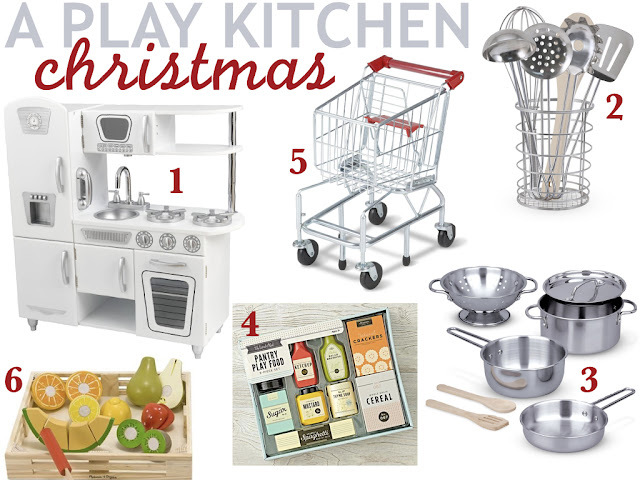 I've been wanting to get a play kitchen for awhile, but we don't really have room for it in our kitchen, which is where it would get the most use. However, I'm determined to make it work! Or we can always put it in the playroom if it really just feels too cramped, we'll see. We already have the shopping cart, but everything else is coming via Santa. The kitchen is currently marked down (under $100) which is essentially what sealed the deal for us. I'm already scouring Etsy for all the cutest felt & wooden food! And that set of pantry items couldn't be more adorable. If only all my condiments had that kind of simple & sweet packaging! If any of you have some kitchen accessory favorites, please do share! The boys are going to light up on Christmas when they see that kitchen and all it's goodies!! The boys will love it!! We have my play kitchen from when I was a child and they love it!! I have added some fun MElissa and Doug food sets and everythign is a hit. Our play kitchen is still a favorite, especially when friends come to play (any age actually)! I wasn't a fan of the felt food, especially with young kids who still put things in their mouth. We love the wooden set you show above, but our all time favorite is this set. Even if you don't use the baskets for sorting, the fruit itself is great! Both our boys love our kitchen, Reid especially! Those pantry items are cute! Do you have plates and bowls? I am constantly being served random food items on a plate! So much fun; they will love it!! My boys got a kitchen just like this one last year [though let's be honest, it was more for the older one at the time than the 6 month old babe ;]. But they LOVE it and play with it all the time! Ours is navy blue and it's absolutely perfect. I've always wanted it in our kitchen, but it's in the play room right now... maybe I'll have to try bringing it up sometime this week. That could be fun. We have the Melissa & Doug brand pots and pans, they're wooden and I love them! They are durable and not too loud when banged on ;) I prefer wooden/felt play food as well, but we were given some Learning Resources play food and it's my favorite! The quality is like none other and it's so real like :) It is the best, I highly recommend looking into it! oh wow such cuteness.. the boys are going to love it! They are going to be thrilled!!! We have a play kitchen in our kitchen and they LOVE it. We are actually upgrading (seems ridiculous, but I found that kitchen for under $30 after some gift cards!) and I got some of these fun accessories too. They will LOVE it! Oh they are just going to LOVE that kitchen! Mason has one (not that one, but a different one) and still plays with it to this day! The boys will LOVE that kitchen. My boys have a kitchen, too, although it's downstairs right now because our tree is up. I love seeing their imagination shine! My SIL bought a play kitchen for our twin nieces and I decided to get some accessories for them. They're only just 1 year old so I found some felt food on Etsy, donuts, breakfast, and pizza!! So cute!! I really love the set you shared from Land of Nod too, soo cute! That's the kitchen we have and Aria adores it. She got it 2 Christmases ago and had no interest in the rest of her presents after she saw it lol. And she plays with it just about daily! I hope your boys love it too. Those tiny little carts are just the cutest!! They are going to LOVE it! My oldest son got a play kitchen when he was 1 and it has been in our kitchen for 11 years now. My younger kids still play with it every single day. Love all of your choices! Play kitchens have come such a long way! I love this so much.